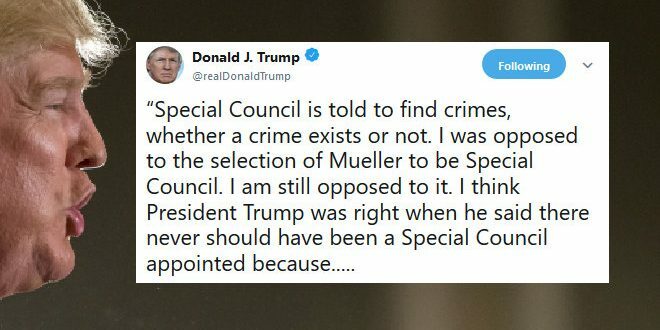 Trump Again Slams Special "Council" Robert Mueller - Joe.My.God. President Donald Trump returned to criticisms of the special counsel investigating Russian election meddling Wednesday, this time quoting Alan Dershowitz on Fox News mounting a vigorous attack on Robert Mueller, saying he never should have been appointed and that there was no evidence of a crime. The tweets come as even Republicans in Washington have become concerned that Trump will fire Mueller, the former FBI director brought in as special counsel after Attorney General Jeff Sessions recused himself from investigating allegations of collusion between the Trump campaign and Russia. “Special Council is told to find crimes, whether a crime exists or not. I was opposed to the selection of Mueller to be Special Council. I am still opposed to it. I think President Trump was right when he said there never should have been a Special Council appointed because…..
…there was no probable cause for believing that there was any crime, collusion or otherwise, or obstruction of justice!” So stated by Harvard Law Professor Alan Dershowitz.